How Is A KeyBar Pocket Key Organizer Is Made? 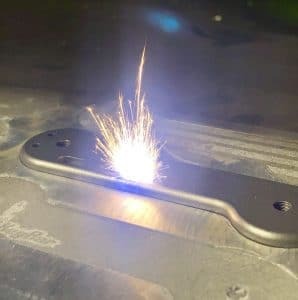 Making a great product starts with having a well-refined creation process, which is something our team at KeyBar maintains with the utmost integrity. 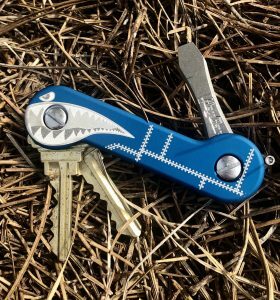 From any one of our KeyBar pocket key organizer products to others like the Quick Draw: each has a principled creation process that emphasizes on crafting a durable, long-lasting product. The product we’d like to discuss in this blog is the making of the KeyBar. We will briefly discuss the overall creation of a standard KeyBar, starting with the raw material and ending with what it will become at the end of the production process. The first step in making KeyBars is choosing the type of metal, which varies based on the KeyBar model (aluminum, titanium, carbon fiber, etc). All of the material we use are sourced through vendors in the USA for quality and consistency. 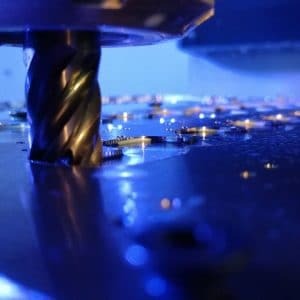 Each type of metal comes in a specific type of solid material for our CNC mill machine. Once the material is prepared, it is then ready to be processed in the CNC mill. Depending on the specific KeyBar model that is being made, there are different steps done to prepare the material for the mill. Once the material is processed through our CNC mill, we are able to create small batches of front and back plates for the KeyBars. Since we have to make the sides of each plate separately, this is a time-consuming process that each part goes through to be crafted. Even though the process is lengthy, it allows us to ensure durability in our KeyBars. After KeyBars are cut in the CNC mill, they are then prepared for finishing. Depending on the KeyBar model, we apply different types of finishing. This includes stonewashing, anodizing, sandblasting or cerakoting. For our standard KeyBars (and many other KeyBars), we use a stone washing tumbler that is applied. This process adds a soft, smooth surface to the KeyBar. After finishing and coating is successfully complete, certain KeyBars are laser engraved for additional designs. All of our laser engraving is done in-house for customization and to deliver a consistent design. Once all additional laser engraving is completed, the product is then moved into assembly. All of our KeyBars (and other products) are assembled in-house at our shop right here in the USA. Each KeyBar is assembled by hand to be prepared for packaging (which is also done by hand). Each KeyBar is packaged in one of our tins and the stickers for the packaging are made in-house. Prior to being shipped, each package is inspected and hand-checked by our team. By keeping the manufacturing process in-house as much as possible along every step, we are proud to create a durable pocket key organizer that is American-made. Since the creation process has started from a garage and has grown into a warehouse, we have stuck close to controlling the quality to ensure that the KeyBar is built to last.